Memory: 16GB PC4 ECC (1x 16GB) Support 24 DIMMs (12 DIMMs per CPU) Memory speed up to 2400 MHz. Network interfaces Four integrated RJ-45 Gigabit Ethernet 1000BASE-T ports (BCM5719); optional Mezzanine LOM (ML2) slot for dual-port or quad-port 10 GbE cards with SFP+ or RJ-45 connectors or quad-port GbE cards with RJ-45 connectors. Models with 8x or 16x 2.5" drive bays: 1x USB 2.0 port (standard) or 3x USB 2.0 ports (optional). Models with 8x 3.5" drive bays: 3x USB 2.0 ports (standard). Models with 24x 2.5" or 12x 3.5" drive bays: 2x USB 2.0 ports (standard). Cooling Calibrated Vectored Cooling with up to six redundant hot-swap fans (four standard, additional two fans with the second processor); two fan zones with N+1 fan redundancy; each fan has one rotor. Operating systems Microsoft Windows Server 2012 R2 and 2012; Red Hat Enterprise Linux 7; SUSE Linux Enterprise Server 11 and 12; VMware vSphere (ESXi) 5.5, and 6.0. With the powerful, versatile 2U rack server design, the dual-socket Lenovo System x3650 M5 (E5-2600 v4) server can run even more workloads, 24 x 7, and gain faster business insights. Integrated with Intel Xeon processor E5-2600 v4 product family and industry-leading two-socket storage capacity, the System x3650 M5 delivers exceptional performance. Flexible and scalable internal storage configurations include up to 28x 2.5-inch or 14x 3.5-inch drives with a wide selection of drive sizes and types. This product guide provides essential pre-sales information to understand the structure of the System x3650 M5 offering, its key features and specifications, components and options, and configuration guidelines. This guide is intended for technical specialists, sales specialists, sales engineers, IT architects, and other IT professionals who want to learn more about the System x3650 M5 and consider its use in IT solutions. This Product Guide describes models of the Lenovo System x3650 M5 (Machine Type 8871) with the Intel Xeon processor E5-2600 v4 product family. For models of the Lenovo System x3650 M5 (Machine Type 5462) with the Intel Xeon processor E5-2600 v3 product family, see the following Product Guide: Lenovo System x3650 M5 (E5-2600 v3). With the powerful, versatile 2U rack server design, the dual-socket Lenovo System x3650 M5 (E5-2600 v4) server (Machine Type 8871) can run even more workloads, 24 x 7, and gain faster business insights. Integrated with Intel Xeon processor E5-2600 v4 product family and industry-leading two-socket storage capacity, the System x3650 M5 delivers exceptional performance. Flexible and scalable internal storage configurations include up to 28x 2.5-inch or 14x 3.5-inch drives with a wide selection of drive sizes and types. Suggested uses: Database, cloud computing and virtualization, enterprise applications, collaboration/email, business analytics and big data, virtual desktops, and Microsoft RemoteFX applications. The System x3650 M5 incorporates energy-smart features for minimized costs and efficient performance. Dual fan zones support operation in up to 40°C environments. The 80 PLUS Titanium power supply units (PSUs) can deliver 96% efficiency at 50% load. The System x3650 M5 has outstanding memory performance that is achieved by supporting two-RDIMMs-per-channel configurations at speeds up to 12% faster than the Intel specification, while still maintaining world-class reliability. The System x3650 M5 integrates leadership security and reliability. System x Trusted Platform Assurance, an exclusive set of System x features and practices, establishes a solid security foundation for your workloads. Enterprise-class data protection is provided with optional self-encrypting drives, and advanced diagnostic tools facilitate reduced downtime and costs. The System x3650 M5 is a versatile 2U dual-socket business-critical server that offers improved performance and pay-as-you-grow flexibility along with new features that improve server management capability. This powerful system is designed for your most important business applications and cloud deployments. Combining balanced performance and flexibility, the System x3650 M5 is a great choice for small and medium businesses up to the large enterprise. It can provide outstanding uptime to keep business-critical applications and cloud deployments running safely. Ease of use and comprehensive systems management tools help make deployment easier. Outstanding reliability, availability, and serviceability (RAS) and high-efficiency design improve your business environment and help save operational costs. Improves productivity by offering superior system performance with the Intel Xeon processor E5-2600 v4 product family with up to 22-core processors, up to 55 MB of L3 cache, and up to 9.6 GT/s QPI interconnect links. Flexible and scalable internal storage provides up to 140 TB for capacity-optimized storage configurations (using 10 TB 3.5-inch hard disk drives [HDDs]) or up to 28 drives for performance-optimized storage configurations in a 2U rack form factor. The use of solid-state drives (SSDs) instead of or along with traditional spinning HDDs can significantly improve I/O performance. An SSD can support a significantly higher number of I/O operations per second (IOPS) than a typical HDD. System x Trusted Platform Assurance, an exclusive set of System x security features and practices, establishes a solid security foundation for workloads by delivering firmware that is securely built, tested, digitally signed and verified prior to execution. The following figure shows the front of the System x3650 M5 server with up to 16x 2.5-inch drive bays and the Front IO Cage Entry (default). 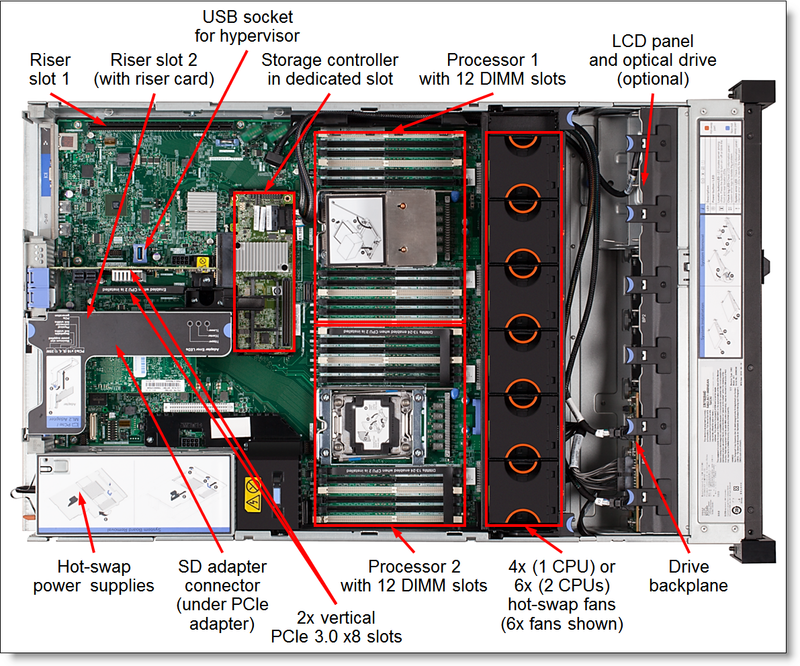 The following figure shows the front of the System x3650 M5 server with 8x 2.5-inch SAS/SATA drive bays, up to 8x 2.5-inch PCIe drive bays (optional), and the Front IO Cage Entry (default). The following figure shows the front of the System x3650 M5 server with up to 16x 2.5-inch drive bays and the Front IO Cage Standard (optional). The following figure shows the front of the System x3650 M5 server with up to 16x 2.5-inch drive bays and the Front IO Cage Advanced (optional). The following figure shows the front of the System x3650 M5 server with up to 24x 2.5-inch drive bays. The following figure shows the front of the System x3650 M5 server with 16x 2.5-inch SAS/SATA and 4x 2.5-inch PCIe drive bays. The following figure shows the front of the System x3650 M5 server with 8x 3.5-inch drive bays. The following figure shows the front of the System x3650 M5 server with 12x 3.5-inch drive bays. The following figure shows the rear of the System x3650 M5 server. The following figure shows the locations of key components inside the System x3650 M5 server. Network interfaces Four integrated RJ-45 Gigabit Ethernet 1000BASE-T ports (BCM5719); optional Mezzanine LOM (ML2) slot for dual-port 10 GbE cards with SFP+ or RJ-45 connectors or quad-port GbE cards with RJ-45 connectors. Operating systems Microsoft Windows Server 2012, 2012 R2, and 2016; Red Hat Enterprise Linux 7; SUSE Linux Enterprise Server 11 and 12; VMware vSphere (ESXi) 5.5 and 6.0. Product availability: Standard models of the x3650 M5 (E5-2600 v4) are not available in North America. * x in the Model number represents a country-specific letter. Ask a Lenovo representative for specifics. ** Processor details: Processor quantity and model, cores, core speed, cache, memory speed, and thermal design power (TDP). § With one processor, only two fixed onboard PCIe slots (Slots 4 and 9) can be used (Slot 5 requires the second processor). An internal storage controller occupies PCIe slot 9. §§ An optional optical drive requires the ODD Cable (00AL956). *** The power supplies are 80 PLUS Platinum certified. # 8 GB 1Rx4 memory DIMM (46W0821). ^ An optional optical drive requires the Front IO Cage Standard (00YD070) or Advanced (00YD002). ^^ An optional LCD display is included in the Front IO Cage Advanced (00YD002). † The maximum number of the drive bays (10) includes 8x 3.5" front bays and 2x 3.5" or 2x 2.5" rear bays. ‡ The maximum number of the drive bays (16) includes 12x 3.5" front bays, 2x 3.5" rear bays, and 2x 2.5" rear bays. The following table lists the TopSeller models of the System x3650 M5. * Processor details: Processor quantity and model, cores, core speed, cache, memory speed, and thermal design power (TDP). ** The power supplies are 80 PLUS Platinum certified. † The maximum number of the drive bays (10) includes 8x 3.5" front bays and 2x 2.5" rear bays. Note: Cable Management Arm (CMA) is not included; see Rack installation for ordering information. The System x3650 M5 supports up to two processors of the Intel Xeon processor E5-2600 v4 product family. The following table lists the specifications of the processors for the System x3650 M5. For System x3650 M5 server models that come standard with one processor, the second processor can be ordered, if required (see the following table for ordering information). The second processor must be of the same model as the first processor. The second processor option includes two system fans. The System x3650 M5 supports TruDDR4 memory. TruDDR4 memory uses the highest-quality components sourced from Tier 1 DRAM suppliers and only memory that meets strict requirements is selected. It is compatibility tested and tuned on every System x server to maximize performance and reliability. The System x3650 M5 supports up to 12 DIMMs with one processor and up to 24 DIMMs when two processors are installed. Each processor has four memory channels, and there are three DIMMs per channel. System x engineering tested and validated system designs that support memory speeds beyond Intel memory specifications, which provides benefits for workloads that require memory speed and density. System x TruDDR4 memory is fully supported up to the rated speeds that are shown in the following table. Table cells highlighted with a gray background indicate when the DIMMs are allowed to operate at a higher speed than Intel specifications define. * Maximum memory capacity is achieved with two processors installed. With one processor, the capacity is a half of what is shown. The following table lists memory options available for the System x3650 M5 server. 8x 3.5-inch drive bay models of the System x3650 M5 have one optical disk drive (ODD) bay. For models with up to 16x 2.5-inch drive bays, the optional Front IO Cage Standard or Advanced provides one optical drive bay and 3x USB 2.0 ports. In addition, the Front IO Cage Advanced provides an LCD display. These options are listed in the following table. * Included with select standard and TopSeller models or configurable via CTO. ** The Front IO Cage Advanced part number (00YD002) includes the Front IO Cage Standard (feature code ATE6), System x3650 M5 2.5" Bezel with LCD Light Path (feature code ATE8), and LCD display (feature code A4VH). If configured via CTO, the LCD display (feature code A4VH) is derived when the Front IO Cage Standard (feature code ATE6) and System x3650 M5 2.5" Bezel with LCD Light Path (feature code ATE8) are selected. 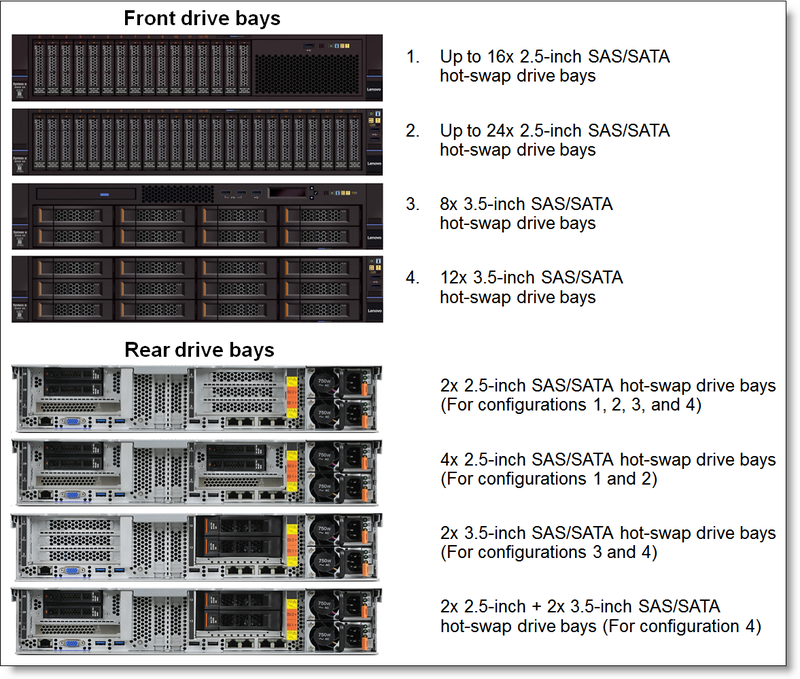 ** The 2x 3.5-inch Rear HDD Kit is connected to the SAS expander on the 12-drive backplane, that is, to the same storage controller as 12 drive bays on the front. *** This Upgrade kit can be installed as a field upgrade only, and it includes 1x NVMe PCIe SSD Upgrade Kit (feature code ASRL) and 2x PCIe SSD Extender Adapters (feature code AS95). * RAID or HBA indicates that any combination of the M1215, M5210, and N2215 storage controllers is supported up to a maximum quantity listed; the numbers in brackets (x+y+z) specify the quantity of drives connected to each of the controllers. # Each PCIe SSD Extender Adapter (PN 00ML997) provides connectivity for up to two PCIe SSDs, and each adapter occupies a PCIe slot. For factory configured models, two or four PCIe SSD Extender Adapters (FC AS95) must be included in the configuration. For field upgrades, the PCIe SSD Upgrade Kit (PN 00FK677) includes two PCIe SSD Extenders. ** Requires the selection of 8x or 16x 2.5-in. hot-swap drive bays (with 16x 2.5-in. drive bays, the internal optical drive cannot be used). ## Requires the selection of 8x 2.5-in. hot-swap drive bays. 24x 2.5-inch front drives are supported on storage dense models only (models without the Standard [feature code ATE5] or Advanced [feature code ATE6] OP Panel). 2x 2.5-inch rear drives (1x Rear 2x 2.5" HDD Kit) are supported on 2.5-inch and 3.5-inch drive bay models. The Rear 2.5" HDD Kit is installed in place of the PCIe Riser Card 1, and PCIe slots 1, 2 and 3 are not present. The kit includes special riser that provides PCIe 3.0 x8 slot for the M1215 RAID controller that is dedicated to 2x 2.5-inch rear drives. 4x 2.5-inch rear drives (2x Rear 2x 2.5" HDD Kits) are supported on 2.5-inch hot-swap drive bay models only. The first Rear 2.5" HDD Kit is installed in place of the PCIe Riser Card 1, and PCIe slots 1, 2 and 3 are not present. The second Rear 2.5" HDD Kit is installed in place of the PCIe Riser Card 2, and PCIe slots 6, 7 and 8 are not present. Each kit includes special riser that provides PCIe 3.0 x8 slot for the M1215 RAID controller that is dedicated to 2x 2.5-inch rear drives. With 8x 3.5-inch HS drive bay models, the 2x 3.5-inch Rear HDD Kit is connected to a dedicated M1215 controller (Independent RAID). With 12x 3.5-inch HS drive bay models, the 2x 3.5-inch Rear HDD Kit can be connected to a dedicated M1215 controller (Independent RAID) or SAS expander on the 12-drive backplane (Cascaded). The Rear 3.5" HDD Kit is installed in place of PCIe Riser Card 2; PCIe slots 6, 7, and 8 are not present. For 8x 3.5-inch and 12x 3.5-inch drive bay models, either 1x Rear 2x 3.5" HDD Kit (Independent RAID) or 1x Rear 2x 2.5" HDD Kit (Independent RAID) can be used in the configuration, but not both. For 12x 3.5-inch drive bay models, either 1x Rear 2x 3.5" HDD Kit (Independent RAID) or 1x Rear 2x 3.5" HDD Kit (Cascaded) can be used in the configuration, but not both. If the Cascaded Kit is used, 1x Rear 2x 2.5" HDD Kit (Independent RAID) also can be used in the configuration. For the Riser 1 options with 3x PCIe x8 slots (part numbers 00KA519 or 00KA498), the PCIe SSD extenders are supported in PCIe slots 1 and 2. For the Riser 1 options with 1x PCIe x8 slot (part number 00KA489), the PCIe SSD extenders are supported in PCIe slots 3 and 4. 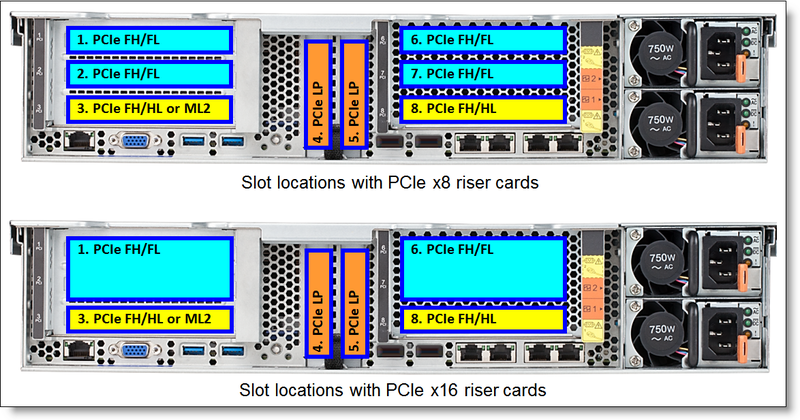 For the Riser 1 and Riser 2 options with 3x PCIe x8 slots (part numbers 00KA519 [Riser 1] or 00KA498 [Riser 1 or Riser 2]), the PCIe SSD extenders are supported in PCIe slots 1 and 2 (Riser 1), and 6 and 7 (Riser 2). For the Riser 1 and Riser 2 options with 1x PCIe x8 slot (part number 00KA489), the PCIe SSD extenders are supported in PCIe slots 3, 4, 5, and 8. If only one NVMe PCIe SSD Upgrade Kit is used in the configurations with two processors, up to one 2.5-inch Rear HDD Kit is supported. In other configurations with the NVMe PCIe SSD Upgrade Kits, the 2.5-inch Rear HDD Kit cannot be used. The following table lists the storage controllers and options used for internal storage of the System x3650 M5. Note: SAS RAID controllers and HBAs are supported in low profile PCIe x8 slots on the system board and full-high PCIe x8 and x16 slots supplied by the riser cards 1 and 2. # 3.5" rear drives support cascaded connections only to the SAS expander on the 12-drive backplane (12x 3.5" drive bay models). The following tables list drive options for the System x3650 M5. * The ODD Cable Kit part number (00AL956) includes two cables: ODD Cable for 3.5" Model (feature code A5GM) and ODD Cable for 2.5" Model (feature code A5V7). For customers who need three PCIe 3.0 x16 slots in the System x3650 M5 for their specific workloads, a special base model 8871-AC3 that can be configured with 3x PCIe 3.0 x16 slots (onboard slot 5 + slots 1 and 6 on the riser cards) is available via CTO (x-config only). PCIe x8 riser card part numbers are 00KA519 (Riser Card 1) and 00KA498 (Riser Card 1 or 2). PCIe x16 riser card part numbers are 00KA504 (Riser Card 1) and 00KA489 (Riser Card 1 or 2). The COM Port Bracket, part number 00KA161, is used for mounting the external serial port on the rear of the System x3650 M5. This option includes the bracket and the cable. The COM Port option is mounted in place of the PCIe slot 5, and the PCIe slot 5 cannot be used. The System x3650 M5 supports four integrated Gigabit Ethernet ports. Optionally, the server supports ML2 adapters that are installed in the custom ML2 slot provided by the PCIe ML2 riser cards (part numbers 00KA504 and 00KA519). This slot supports adapters with either two 10 Gb ports or four Gigabit Ethernet ports and supports direct connectivity to the IMM2.1 service processor for out-of-band systems management. ML2 network adapters are supported in the ML2 slot 1 supplied by one of the ML2 Riser Cards (part numbers 00KA504 and 00KA519). Unless otherwise specified in the table footnote for the specific adapter, PCIe network adapters are supported in low profile PCIe x8 slots on the system board and full-high PCIe x8 and x16 slots supplied by the riser cards 1 and 2. # The maximum quantity shown is with one processor / two processors (this does not apply to ML2 adapters). † Supported only in the PCIe 3.0 x16 slots supplied by the PCIe x16 riser cards (part numbers 00KA504 and 00KA489). The following table lists SAS RAID controllers and HBAs for external storage attachments that are supported by the System x3650 M5 server. Note: Unless otherwise specified in the table footnote for the specific adapter, SAS RAID controllers and HBAs are supported in low profile PCIe x8 slots on the system board and full-high PCIe x8 and x16 slots supplied by the riser cards 1 and 2. ** One FoD upgrade for the M5225 activates the feature on all M5200 series controllers (M5210, M5225) installed in the server. *** Supported only in the PCIe x16 riser cards (part numbers 00KA504 and 00KA489). Note: FC HBAs are supported in low profile PCIe x8 slots on the system board and full-high PCIe x8 and x16 slots supplied by the riser cards 1 and 2. Note: Flash storage adapters are supported in low profile PCIe x8 slots on the system board (low profile adapters only) and full-high PCIe x8 and x16 slots supplied by the riser cards 1 and 2. With 3.5-inch drive bay models, the Flash Adapters are supported only in the environments with the air temperature of up to 30 °C (86 °F). The NVIDIA PCIe x16 adapters (x16-wired) require PCIe x16 riser cards. The NVIDIA PCIe x16 adapters (x8-wired) are supported with PCIe x8 or PCIe x16 riser cards, or a combination of PCIe x8 and PCIe x16 riser cards (with PCIe x16 riser cards, slots 2 [Riser 1] and 7 [Riser 2] are not available). Each M6000 GPU requires at least 48 GB of memory. With 2.5-inch drive bay models, the GPU adapters are supported only in the environments with the air temperature of up to 35 °C (95 °F). NVIDIA GPU adapters: Air temperature of up to 35 °C (95 °F). Intel GPU adapters: Air temperature of up to 30 °C (86 °F) and up to 120 W TDP processors. Further restrictions may apply depending on the power supplies installed (see Power supplies and cables). redundancy, and each system fan has one rotor. processors include six system fans. An optional PCIe thermal solution kit is also required if any of the ML2 adapters are present in the configuration. The PCIe thermal kit contains an air baffle. The following table shows additional cooling options. The System x3650 M5 server supports up to two redundant power supplies, and is capable of N+N redundancy depending on the configuration. Standard models come with one power supply. The following table lists the power supply options. The System x3650 M5 servers ship standard with or without a power cord (model dependent). A hot-swap power supply option ships standard with one 2.8m, 10A/100-250V, IEC 320-C13 to C14 rack power cable. The System x3650 M5 server supports VMware ESXi installed on a USB memory key or one or two SD cards in the SD Media Adapter. The USB memory key is installed in a USB socket inside the server. The SD Media Adapter is installed in a dedicated slot inside the server. The System x3650 M5 server contains Integrated Management Module II (IMM2.1), which provides advanced service-processor control, monitoring, and an alerting function. If an environmental condition exceeds a threshold or if a system component fails, the IMM2.1 lights LEDs to help you diagnose the problem, records the error in the event log, and alerts you to the problem. Optionally, the IMM2.1 also provides a virtual presence capability for remote server management capabilities. All System x3650 M5 server models include basic light path diagnostics, which provides the system LEDs on the front of the server (see Components and connectors) and the LEDs near the monitored components (for example, the DIMM error LED on the system board). Storage dense server models (models with USB ports and system LEDs that are located on the right EIA bracket) with 8x or 16x 2.5-inch front drive bays that are upgradeable to 24x 2.5-inch front drive bays and models with 12x 3.5-inch front drive bays do not support an LCD display panel. * The Front IO Cage Advanced part number (00YD002) includes the Front IO Cage Standard (feature code ATE6), System x3650 M5 2.5" Bezel with LCD Light Path (feature code ATE8), and LCD display (feature code A4VH). If configured via CTO, the LCD display (feature code A4VH) is derived when the Front IO Cage Standard (feature code ATE6) and System x3650 M5 2.5" Bezel with LCD Light Path (feature code ATE8) are selected. Note: The System x Enterprise Slides Kit, part number 00FK656, is included with the standard models that are listed in Table 2 and TopSeller models that are listed in Table 3. The System x3650 M5 has a three-year customer-replaceable unit (CRU) and onsite (for field-replaceable units [FRUs] only) limited warranty with standard call center support during normal business hours and 9x5 Next Business Day Parts Delivered. Also available are Lenovo Services warranty maintenance upgrades and post-warranty maintenance agreements, with a well-defined scope of services, including service hours, response time, term of service, and service agreement terms and conditions. In the Parts & Services box in the middle of the page, click the Services only radio button. In the same box, type in your machine type model and press Enter. From the search results, you can click either Deployment Services or Support Services to view the offerings. Committed Repair 6 hours: The time period between the service request registration in Lenovo’s call management system and the restoration of the product to conformance with its specification by a Service Technician. In addition, you can access hardware “how to” support for System x servers. Staff can help resolve hardware problems not covered under warranty, refer you to the right documentation and publications, provide corrective service information for known defects, and transfer you to a hardware support call center if needed. The following table lists the 6 Gbps SAS external drive enclosures that are offered by Lenovo that can be used with the System x3650 M5 for storage expansion. The following table lists the relationship models of the 12 Gbps SAS external drive enclosures that are offered by Lenovo that can be used with the System x3650 M5 for storage expansion. The following table lists the TopSeller models of the 12 Gbps SAS external drive enclosures that are offered by Lenovo that can be used with the System x3650 M5 for storage expansion. The following table lists the external storage systems that are currently offered by Lenovo that can be used with the System x3650 M5 in storage solutions. * Machine Type; see the respective Product Guide in the NAS Storage category (http://lenovopress.com/storage/nas) for models. ** Available only in China. The following table lists the Ethernet LAN switches that are offered by Lenovo that can be used with the System x3650 M5 in network connectivity solutions. The following table lists the Fibre Channel SAN switches that are offered by Lenovo that can be used with the System x3650 M5 in FC SAN storage connectivity solutions.